Diana was born into a family of British nobility with royal ancestry and was the fourth child and third daughter of John Spencer, Viscount Althorp, and the Honourable Frances Roche. She grew up in Park House, situated on the Sandringham estate, and was educated in England and Switzerland. In 1975, after her father inherited the title of Earl Spencer, she became known as Lady Diana Spencer. She came to prominence in February 1981 when her engagement to Prince Charles was announced. Her wedding to the Prince of Wales on 29 July 1981, held at St Paul's Cathedral, reached a global television audience of over 750 million people. While married, Diana bore the titles Princess of Wales, Duchess of Cornwall, Duchess of Rothesay, and Countess of Chester. 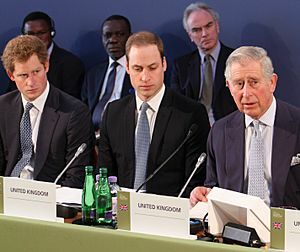 The marriage produced two sons, the princes William and Harry, who were then respectively second and third in the line of succession to the British throne. As Princess of Wales, Diana undertook royal duties on behalf of the Queen and represented her at functions overseas. She was celebrated for her charity work and for her support of the International Campaign to Ban Landmines. She was involved with dozens of charities including London's Great Ormond Street Hospital for children, of which she was president from 1989. Diana remained the object of worldwide media scrutiny during and after her marriage, which ended in divorce on 28 August 1996. 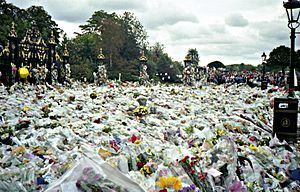 Media attention and public mourning were extensive after her death in a car crash in Paris on 31 August 1997 and subsequent televised funeral. Diana was born on 1 July 1961, in Park House, Sandringham, Norfolk. She was the fourth of five children of John Spencer, Viscount Althorp (1924–1992), and his first wife, Frances (née Roche; 1936–2004). The Spencer family has been closely allied with the British Royal Family for several generations. Both of Diana's grandmothers had served as ladies-in-waiting to Queen Elizabeth The Queen Mother. Diana was seven years old when her parents divorced. Diana first met Charles, Prince of Wales, in November 1977 when he was dating her sister, Lady Sarah. He took a serious interest in her as a potential bride during the summer of 1980, when they were guests at a country weekend, and she watched him play polo. The relationship developed as he invited her for a sailing weekend to Cowes aboard the royal yacht Britannia. This was followed by an invitation to Balmoral (the Royal Family's Scottish residence) to meet his family a weekend in November 1980. Lady Diana was well received by the Queen, the Duke of Edinburgh, and Queen Elizabeth The Queen Mother. The couple subsequently courted in London. The Prince proposed on 6 February 1981, and Lady Diana accepted, but their engagement was kept secret for the next few weeks. Their engagement became official on 24 February 1981. Lady Diana selected a large engagement ring consisting of 14 solitaire diamonds surrounding a 12-carat oval blue Ceylon sapphire set in 18-carat white gold, similar to her mother's engagement ring. The ring was made by the then Crown jewellers Garrard but, unusually for a ring for a member of the Royal Family, it was not unique; it was featured in Garrard's jewellery collection. In 2010 the ring became the engagement ring of Catherine, Duchess of Cambridge. It was copied by jewellers all over the world. The Queen Mother gave Lady Diana a sapphire and diamond brooch as an engagement present. Following the engagement Lady Diana left her job at the nursery and lived at Clarence House, then home of the Queen Mother, for a short period. She then lived at Buckingham Palace until the wedding. Being the first Englishwoman to become the spouse of an heir apparent in 300 years, she was also the first royal bride to have a paying job before her engagement. 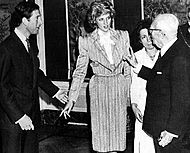 Her first public appearance with Prince Charles was in a charity ball in March 1981 at Goldsmiths' Hall, where she met the Princess of Monaco. 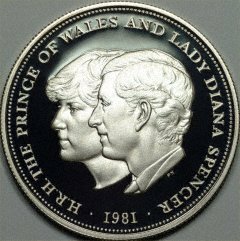 Twenty-year-old Diana became Princess of Wales when she married the Prince of Wales on 29 July 1981 at St Paul's Cathedral, which offered more seating than Westminster Abbey, generally used for royal nuptials. Widely described as a "fairytale wedding", it was watched by a global television audience of 750 million while 600,000 people lined the streets to catch a glimpse of the couple en route to the ceremony. At the altar, Diana accidentally reversed the order of Charles's first two names, saying "Philip Charles" Arthur George instead. She did not say that she would "obey" him; that traditional vow was left out at the couple's request, which caused some comment at the time. Diana wore a dress valued at £9,000 with a 25-foot (7.62-metre) train. Music and songs used during the wedding included the "Prince of Denmark's March", "I Vow to Thee, My Country", "Pomp and Circumstance No.4", and "God Save the Queen". After becoming Princess of Wales, Diana automatically acquired rank as the third-highest female in the United Kingdom Order of Precedence (after the Queen and the Queen Mother), and was fifth or sixth in the orders of precedence of her other realms, following the Queen, the relevant viceroy, the Duke of Edinburgh, the Queen Mother, and the Prince of Wales. 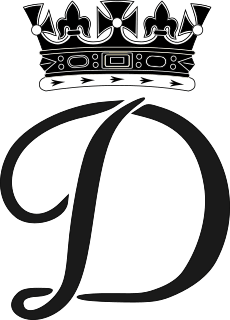 Within a few years of the wedding, the Queen extended Diana visible tokens of membership in the Royal Family; she lent the Princess the Cambridge Lover's Knot Tiara, and granted her the badge of the Royal Family Order of Queen Elizabeth II. The couple made their homes at Kensington Palace and at Highgrove House, near Tetbury. On 5 November 1981, the Princess's first pregnancy was officially announced. 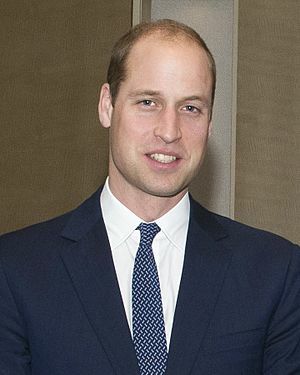 In the private Lindo Wing of St Mary's Hospital in Paddington, London, on 21 June 1982, the Princess gave birth to her and the Prince's first son and heir, William Arthur Philip Louis. Amidst some media criticism, she decided to take William, still a baby, on her first major tours of Australia and New Zealand, but the decision was popularly applauded. By her own admission, the Princess of Wales had not initially intended to take William until it was suggested by Malcolm Fraser, the Australian prime minister. A second son, Henry Charles Albert David, was born on 15 September 1984. The Princess asserted she and the Prince were closest during her pregnancy with Harry (as the younger prince has always been known). She was aware their second child was a boy, but did not share the knowledge with anyone else, including the Prince of Wales. Diana and Prince Charles divorced on 28 August 1996. Buckingham Palace stated the Princess of Wales was still a member of the Royal Family, as she was the mother of the second and third in line to the throne. In October 1981, the Princess and Princess visited Wales. The Princess of Wales attended the State Opening of Parliament for the first time on 4 November 1981. Her first solo engagement was a visit to Regent Street on 18 November 1981 to switch on the Christmas lights. She attended the Trooping the Colour for the first time in June 1982, making her appearance on the balcony of Buckingham Palace afterwards. The Princess made her inaugural overseas tour in September 1982, to attend the state funeral of Grace, Princess of Monaco. Also in 1982, Diana accompanied the Prince of Wales to the Netherlands and was created a Grand Cross of the Order of the Crown by Queen Beatrix of the Netherlands. In 1983, she accompanied the Prince on a tour of Australia and New Zealand with Prince William, where they met with representatives of the Māori people. Their visit to Canada in June and July 1983 included a trip to Edmonton to open the 1983 Summer Universiade and a stop in Newfoundland to commemorate the 400th anniversary of that island's acquisition by the Crown. In February 1984, as the patron of London City Ballet, Diana travelled to Norway on her own to attend a performance organised by the company. In April 1985, the Prince and Princess of Wales visited Italy, and were later joined by Princes William and Harry. They met with President Alessandro Pertini. Their visit to the Holy See included a private audience with Pope John Paul II. In November 1985, the couple visited the United States, meeting President Ronald Reagan and First Lady Nancy Reagan at the White House. 1986 was a busy year for Diana. With the Prince of Wales she embarked on a tour of Japan, Indonesia, Spain, and Canada. In Canada they visited Expo 86. In 1988, the Prince and Princess of Wales visited Thailand and toured Australia for the bicentenary celebrations. In February 1989, she spent a few days in New York as a solo visit. During a tour of Harlem Hospital Center, she made a profound impact on the public by spontaneously hugging a seven-year-old child with AIDS. In her desire to play an encouraging role during the Gulf War, the Princess of Wales visited Germany in December 1990 to meet with the families of soldiers. She subsequently travelled to Germany in January 1991 to visit RAF Bruggen, and later wrote an encouraging letter which was published in Soldier, Navy News and RAF News. In 1991, the Prince and Princess of Wales visited Queen's University in Kingston, Ontario, where they presented the university with a replica of their royal charter. In September 1991, the Princess visited Pakistan on a solo trip, and went to Brazil with Charles. During the Brazilian tour, Diana paid visits to organizations that battled homelessness among street children. Her final trips with Charles were to India and South Korea in 1992. She visited Mother Teresa's hospice in Kolkata, India, in 1992, and the two women developed a personal relationship. In 1992, the Princess of Wales visited Egypt. She was invited to stay at the British Ambassador's villa, and met with President Hosni Mubarak. Although in December 1993 she had announced that she would withdraw from public life, she stated in November 1994 that she wished to "make a partial return". In her capacity as the vice-president of British Red Cross, she was interested in playing an important part for its 125th anniversary celebrations. Later, the Queen formally invited her to attend the anniversary celebrations of D-Day. In February 1995, the Princess visited Japan. She paid a formal visit to Emperor Akihito and Empress Michiko. In June 1995, Diana went to Venice to visit the Venice Biennale art festival. In November 1995, the Princess undertook a four-day trip to Argentina in order to attend a charity event. The Princess visited many other countries, including Belgium, Nepal, Switzerland, and Zimbabwe, alongside numerous others. During her separation from Charles which lasted for almost four years, she participated in major national occasions as a senior member of the Royal Family, notably including "the commemorations of the 50th anniversaries of Victory in Europe Day and Victory over Japan Day" in 1995. The Princess's 36th and final birthday celebration was held at Tate Gallery which was also a commemoration event for the gallery's 100th anniversary. In addition to health-related matters, Diana's extensive charity work included campaigning for animal protection and her fight against the use of landmines. She was the patroness of charities and organisations working with the homeless, youth, drug addicts, and the elderly. From 1989, she was president of Great Ormond Street Hospital for Children. From 1991 to 1996, she was a patron of Headway, a brain injury association. She was patron of Natural History Museum and president of Royal Academy of Music. From 1984 to 1996, she was president of Barnardo's, a charity founded by Dr. Thomas John Barnardo in 1866 to care for vulnerable children and young people. In 1988, she became patron of the British Red Cross and supported its organisations in other countries such as Australia and Canada. She made several lengthy visits each week to Royal Brompton Hospital, where she worked to comfort seriously ill or dying patients. In 1992, she became the first patron of Chester Childbirth Appeal, a charity that she had supported since 1984. The charity, which is named after one of Diana's royal titles, could raise over £1 million with her help. Her patronages also included Landmine Survivors Network, Help the Aged, the National Hospital for Neurology and Neurosurgery, the British Lung Foundation, Eureka! (joint patron with Prince Charles), the National Children's Orchestra, British Red Cross Youth, the Guinness Trust, Meningitis Trust, Dove House, the Malcolm Sargent Cancer Fund for Children, the Royal School for the Blind, Welsh National Opera, the Variety Club of New Zealand, Birthright, the British Deaf Association, All England Lawn Tennis and Croquet Club, Anglo-European College of Chiropractic, Royal Anthropological Institute of Great Britain and Ireland, Royal National Orthopaedic Hospital, British Sports Association for the Disabled, British Youth Opera, Chickenshed, Commonwealth Society for the Deaf, Faculty of Dental Surgery of the Royal College of Surgeons of England, Garden Festival of Wales, Gloucestershire County Cricket Club, Honourable Society of the Middle Temple, London City Ballet, London Symphony Chorus, London Symphony Orchestra, Parkinson's Disease Society, Pre-School Playgroups Association, Swansea Festival of Music and the Arts, Welsh Bowling Association, Worshipful Company of Merchant Taylors, as well as president or patron of other charities. 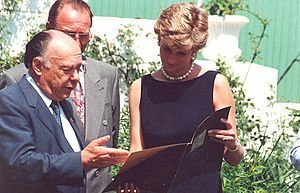 In June 1995, the Princess travelled to Moscow. She paid a visit to a children's hospital that she had previously supported by providing them with medical equipment. In Moscow, she received the International Leonardo Prize, which is given to "the most distinguished patrons and people in the arts, medicine, and sports". In December 1995, Diana received the United Cerebral Palsy Humanitarian of the Year Award in New York City for her philanthropic efforts. In October 1996, for her works on the elderly, the Princess was awarded a gold medal at a health care conference organised by the Pio Manzù Centre in Rimini, Italy. The day after her divorce, she announced her resignation from over 100 charities to spend more time with only six: Centrepoint, English National Ballet, Great Ormond Street Hospital, The Leprosy Mission, National AIDS Trust, and the Royal Marsden Hospital. She continued her work with the British Red Cross Anti-Personnel Land Mines Campaign, but was no longer listed as patron. The Princess began her work with AIDS victims in the 1980s. In 1989, she opened Landmark Aids Centre in South London. She was not averse to making physical contact with AIDS patients, though it was still unknown whether the disease could be spread that way. Diana was the first British royal figure to contact AIDS patients. One of her early efforts to de-stigmatise the condition included holding hands of an AIDS patient in 1987. Diana noted: "HIV does not make people dangerous to know. You can shake their hands and give them a hug. Heaven knows they need it. What's more, you can share their homes, their workplaces, and their playgrounds and toys." To Diana's disappointment, the Queen did not support this type of charity work, suggesting she get involved in "something more pleasant". In October 1990, Diana opened Grandma's House, a home for young AIDS victims in Washington, D.C. She was also a patron of the National AIDS Trust. In 1991, she famously hugged one victim during a visit to the AIDS ward of the Middlesex Hospital. 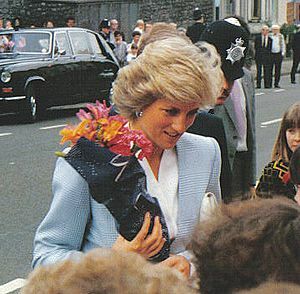 As the patron of Turning Point, a health and social care organisation, Diana visited its project in London for people with HIV/AIDS in 1992. She later established and lead fundraising campaigns for AIDS research. In March 1997, Diana visited South Africa, where she met with President Nelson Mandela. On 2 November 2002, Mandela announced that the Nelson Mandela Children's Fund would be teaming up with the Diana, Princess of Wales Memorial Fund to help victims of AIDS. They had planned the combination of the two charities a few months before her death. "When she stroked the limbs of someone with leprosy or sat on the bed of a man with HIV/AIDS and held his hand, she transformed public attitudes and improved the life chances of such people," Mandela said about the late Princess. Diana had used her celebrity status to "fight stigma attached to people living with HIV/AIDS", Mandela said. Diana was the patron of HALO Trust, an organization that removes debris left behind by war, in particular landmines. In January 1997, pictures of Diana touring an Angolan minefield in a ballistic helmet and flak jacket were seen worldwide. During her campaign, she was accused of meddling in politics and called a 'loose cannon'. 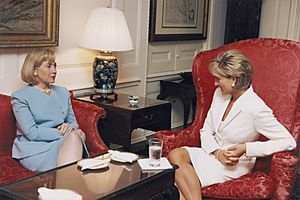 Despite the criticism, HALO states that Diana's efforts resulted in raising international awareness about landmines and the subsequent sufferings caused by them. In June 1997, she gave a speech at a landmines conference held at the Royal Geographical Society, and travelled to Washington, D.C. to help promote the American Red Cross landmines campaign. From 7 to 10 August 1997, just days before her death, she visited Bosnia and Herzegovina with Jerry White and Ken Rutherford of the Landmine Survivors Network. Carol Bellamy, Executive Director of the United Nations Children's Fund (UNICEF), said that landmines remained "a deadly attraction for children, whose innate curiosity and need for play often lure them directly into harm's way". She urged countries which produce and stockpile the largest numbers of landmines (United States, China, India, North Korea, Pakistan, and Russia) to sign the treaty. A few months after Diana's death in 1997, the International Campaign to Ban Landmines won the Nobel Peace Prize. For her first solo official trip, Diana visited The Royal Marsden NHS Foundation Trust, a cancer treatment hospital in London. She later chose this charity to be among the organisations that benefited from the auction of her clothes in New York. The trust's communications manager said, "The Princess had done much to remove the stigma and taboo associated with diseases such as cancer, AIDS, HIV and leprosy." Diana became president of the hospital on 27 June 1989. The Wolfson Children's Cancer Unit was opened by Diana on 25 February 1993. In June 1996, she travelled to Chicago in her capacity as president of the Royal Marsden Hospital in order to attend a fundraising event and raised more than £1 million for cancer research. In September 1996, after being asked by Katharine Graham, the Princess went to Washington and appeared at a White House breakfast in respect of the Nina Hyde Center for Breast Cancer Research. She also attended an annual fund-raiser for breast cancer research organised by The Washington Post at the same center. Children with Leukaemia (currently Children with Cancer UK) was opened by the Princess of Wales in memory of two young cancer victims in 1988. In November 1987, a few days after the death of Jean O'Gorman from cancer, Diana met her family. The deaths of Jean and her brother had an impact on the Princess, and she assisted their family to establish the charity. It was opened by her on 12 January 1988 at Mill Hill Secondary School, and she supported it until her death in 1997. In November 1989, the Princess visited a leprosy hospital in Indonesia. Following her visit, she became patron of the Leprosy Mission, an organisation dedicated to providing medicine, treatment, and other support services to those who are afflicted with the disease. She remained the patron of this charity until her death in 1997, and visited several of its hospitals around the world, especially in India, Nepal, Zimbabwe and Nigeria. She famously touched those affected by the disease when many people believed it could be contracted through casual contact. "It has always been my concern to touch people with leprosy, trying to show in a simple action that they are not reviled, nor are we repulsed," she commented. The Diana Princess of Wales Health Education and Media Centre in Noida, India, was opened in her honour in November 1999, funded by the Diana Princess of Wales Memorial Fund to give social support to the people affected by leprosy and disability. Diana was a long-standing and active supporter of Centrepoint, a charity which provides accommodation and support to homeless people, and became patron in 1992. She supported organisations that battle poverty and homelessness. The Princess was a supporter of young homeless people and spoke out on behalf of them by saying that "they deserve a decent start in life". "We, as a part of society, must ensure that young people – who are our future – are given the chance they deserve," she said. Diana used to take young William and Harry for private visits to Centrepoint services. "The young people at Centrepoint were always really touched by her visits and by her genuine feelings for them," said one of the charity's staff members. Prince William is currently the patron of this charity. 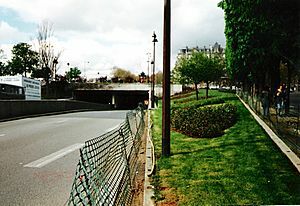 On 31 August 1997, Diana was fatally injured in a car crash in the Pont de l'Alma road tunnel in Paris, which also caused the deaths of her companion Dodi Fayed and the driver, Henri Paul, acting security manager of the Hôtel Ritz Paris. 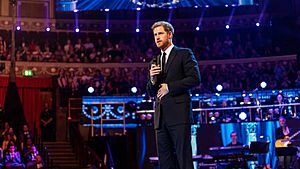 The funeral saw the British television audience peak at 32.10 million, one of the United Kingdom's highest viewing figures ever, while millions more watched the event around the world. The sudden and unexpected death of an extraordinarily popular royal figure brought statements from senior figures worldwide and many tributes by members of the public. People left public offerings of flowers, candles, cards, and personal messages outside Kensington Palace for many months. 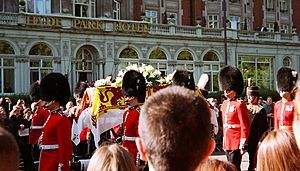 Her coffin, draped with the royal flag, was brought to London from Paris by Prince Charles and Diana's two sisters on 31 August 1997. After being taken to a private mortuary it was placed in the Chapel Royal, St James's Palace. Diana's funeral took place in Westminster Abbey on 6 September. The previous day Queen Elizabeth II had paid tribute to her in a live television broadcast. Her sons walked in the funeral procession behind her coffin, along with the Prince of Wales, the Duke of Edinburgh, Diana's brother Lord Spencer, and representatives of some of her charities. Lord Spencer said of his sister, "She proved in the last year that she needed no royal title to continue to generate her particular brand of magic." 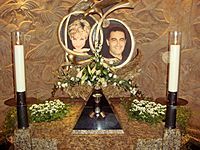 Re-written in tribute to Diana, "Candle in the Wind" was performed by Elton John at the funeral service (the only occasion the song has been performed live). Released as a single in 1997, the global proceeds from the song have gone to Diana's charities. 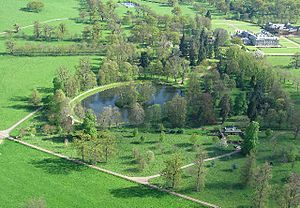 Aerial view of Althorp. 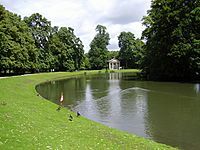 Diana is buried on the small island in the middle of the ornamental Round Oval lake. The burial occurred privately later the same day. Diana's former husband, sons, mother, siblings, a close friend, and a clergyman were present. Diana's body was clothed in a black long-sleeved dress designed by Catherine Walker, which she had chosen some weeks before. A set of rosary beads was placed in her hands, a gift she had received from Mother Teresa, who died the same week as Diana. Her grave is on an island within the grounds of Althorp Park, the Spencer family home for centuries. Among the members of the Royal Family throughout history, Diana remains one of the most popular and still continues to influence the principles of the Royal Family and its young generation. From her engagement to the Prince of Wales in 1981 until her death in 1997, Diana was a major presence on the world stage, often described as the "world's most photographed woman". She was noted for her compassion, style, charisma, and high-profile charity work. In 1997, the Princess was one of the runner-ups for Time Man of the Year. In 1999, Time magazine named Diana one of the 100 Most Important People of the 20th Century. In 2002, Diana was ranked third on the BBC's poll of the 100 Greatest Britons, outranking the Queen and other British monarchs. The Princess of Wales at the 1987 Cannes Film Festival. The strapless Catherine Walker dress, which was inspired by a dress worn by Grace Kelly in To Catch a Thief, is considered to be among the most iconic dresses worn at the festival throughout history. It was later sold to Julien's Auctions for over £80,000. Diana was a fashion icon whose style was emulated by women around the world. The Princess chose her dressing style based on both the Royal Family's demands and popular modern styles in Britain, and developed her personal trend of fashion. The Princess was named to the International Best Dressed List Hall of Fame in 1989. In 2004, People cited her as one of the all-time most beautiful women. In 2012, Time magazine included Diana on its All-TIME 100 Fashion Icons list. The Flame of Liberty, erected in 1989 on the Place de l'Alma in Paris above the entrance to the tunnel in which the fatal crash occurred, has become an unofficial memorial to Diana. In addition, there are two memorials inside Harrods department store, commissioned by Dodi Fayed's father, who owned the store from 1985 to 2010. The first memorial is a pyramid-shaped display containing photos of the princess and al-Fayed's son, a wine glass said to be from their last dinner, and a ring purchased by Dodi the day prior to the crash. The second, Innocent Victims, unveiled in 2005, is a bronze statue of Fayed dancing with Diana on a beach beneath the wings of an albatross. In February 2013, OCAD University in Toronto announced that its new 25,000 square foot arts centre would be named the Princess of Wales Visual Arts Centre. Princess Diana Drive was named in her memory in Trenton, New Jersey. Diana's granddaughter, Charlotte Elizabeth Diana (born 2015), and her niece, Charlotte Diana (born 2012), are named after her. In 2017, Diana's sons commissioned a statue of their mother for Kensington Palace to commemorate the 20th anniversary of her death. In an official statement released by Kensington Palace the Princes said "Our mother touched so many lives. We hope the statue will help all those who visit Kensington Palace to reflect on her life and her legacy." The money will be raised through public donations, and a small committee consisting of close friends and advisers, including Diana's sister Lady Sarah McCorquodale, are said to be working on the project. Posthumously, as in life, she is most popularly referred to as "Princess Diana", a title not formally correct and one she never held. 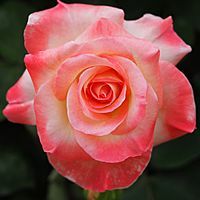 She is still sometimes referred to in the media as "Lady Diana Spencer" or simply as "Lady Di". In a speech after her death, then-Prime Minister Tony Blair referred to Diana as the People's Princess. Diana was born into the British noble Spencer family, different branches of which currently hold the titles of Duke of Marlborough, Earl Spencer, Earls of Sunderland, and Viscount Churchill. The Spencers claimed descent from a cadet branch of the powerful medieval Despenser family, but its validity is questioned. Her great-grandmother was Margaret Baring, a member of the German-British Baring family of bankers and the daughter of Edward Baring, 1st Baron Revelstoke. Diana's distant noble ancestors included John Churchill, 1st Duke of Marlborough and Prince of Mindelheim and his wife Sarah, Duchess of Marlborough. Diana and Charles were distantly related, as they were both descended from the House of Tudor through Henry VII of England. 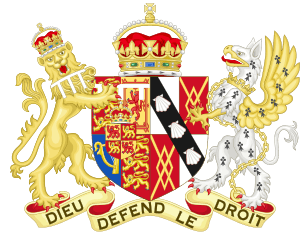 She was also descended from the House of Stuart through Charles II of England by Charles Lennox, 1st Duke of Richmond, and Henry FitzRoy, 1st Duke of Grafton, and his brother James II of England by Henrietta FitzJames. Diana's American roots came from her great-grandmother Frances Ellen Work, daughter of wealthy American stockbroker Franklin H. Work from Ohio, who was married to her great-grandfather James Roche, 3rd Baron Fermoy. Diana's fourth great-grandmother in her direct maternal line, Eliza Kewark, whose daughter was fathered by Theodore Forbes, is variously described in contemporary documents as "a dark-skinned native woman", "an Armenian woman from Bombay", and "Mrs. Forbesian". Genealogist William Addams Reitwiesner assumed she was Armenian. In June 2013, BritainsDNA announced that genealogical DNA tests on two of Diana's distant cousins in the same direct maternal line confirm that Eliza Kewark was of Indian descent. 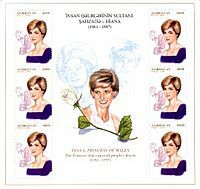 Diana, Princess of Wales Facts for Kids. Kiddle Encyclopedia.